Local councillor John Clare thanked businesses after he was awarded a special Aycliffe Ambassador award during the third Make Your Mark ceremony on Aycliffe Business Park. Cllr Clare was handed the gong for his outstanding contribution to the business park at the end of the awards presentation, held at the Xcel Centre. “It’s a total surprise and I’m humbled,” he said. He then told guests: “I think of myself as a representative of the people, so on their behalf can I just say… you put the bread and butter on our tables, you are the future – not just for Aycliffe, but for County Durham. “On your shoulders rest the future of our children. You are so important to us. We can’t think of going into the future without you building and growing and working. For the first time, the new Aycliffe Business Park Community (ABPC) board decided to create the new Aycliffe Ambassador award to recognise the outstanding contribution an individual has made to Aycliffe Business Park and Newton Aycliffe. Before handing over the award, ABPC chair Kerina Clark told guests: “He has been a prolific advocate of Aycliffe Business Park. “He is extremely active on social media – Facebook and Twitter in particular – and is the first to “talk up” Aycliffe Business Park, to shout about our success stories and to make a hugely-positive impact on the thousands of people who follow him. “Whenever he talks, he exudes passion, positivity and patriotism for Aycliffe. Meanwhile, fourth generation family firm PWS which manufactures kitchen components was named Aycliffe Business Park’s Company of the Year during Make Your Mark. The award was presented by John Finley, managing director of steel firm Finley Structures, which won the same recognition last year and sponsored it this time around. PWS, which employs 300 people across its sites on Aycliffe Business Park, is a market leader in the design and supply of quality kitchen components and worksurfaces to manufacturers, retailers and installers. While product development and innovation continues to be the driving force behind the business, PWS also prides itself on being a good corporate citizen, engaging with the local community, which was demonstrated in their partnership with Help for Heroes when the company and its staff raised a record-breaking £314,000 for the charity in 2016. PWS managing director John Lennon said: “We are delighted to be crowned overall Company of the Year. Elsewhere during the Make Your Mark event, Hitachi Rail won the Apprenticeships award, which was sponsored by Gestamp Tallent. Hitachi has created hundreds of new jobs in Aycliffe, including more than 50 apprenticeships already. Arlington Automotive was crowned winners of the Employer of the Year award, which was sponsored by NBSL. Having obtained the Investors in People accreditation, Arlington Automotive also works with Job Centre Plus to provide work experience opportunities for people with barriers to work and assist in developing skills that are transferable to other businesses. Premo Fabrications won the Engineering & Manufacturing award, which was sponsored by Business Durham. Formed in 2009 with nine employees, Preo now has more than 50 staff and since year one have increased turnover by over 150%. Stiller Warehousing & Distribution was handed the Innovation award, which was sponsored by Endeavour Partnership, after the family-run firm launched an innovative scheme to encourage people to take up a career in HGV driving with its own in-house ‘earn while you learn’ scheme. Primex Plastics won the Export award, which was sponsored by the Department for International Trade. Primex currently exports to 10 EU countries and two others around the world, while its production has more than doubled in the last six years. Fourth generation family business Beaumont Grounds Maintenance picked up the Small Business of the Year award, which was sponsored by the Xcel Centre. Beaumont’s team has grown over the last year and the firm prides itself on family values that remain at the heart of the company. 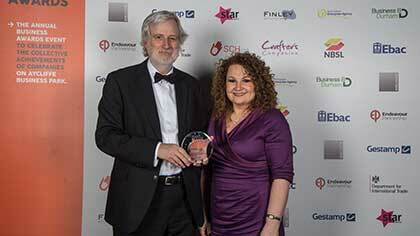 Trident Manor, which provides risk management consultancy services to a wide range of local, regional, national and international clients, won the Service Business of the Year award, which was sponsored by South Durham Enterprise Agency. Trident has helped businesses save more than £100,000 in security costs, while its international activities have covered Kazakhstan, Cyprus, Russia, Croatia and the USA. UTC South Durham picked up the Newcomer award, which was sponsored by Ebac. The UTC opened in September 2016 with an intake of 160 students from years 10 and 12 and is set to double its current team. Ben Thubron of Baltic Training Services won the Apprentice of the Year award, which was sponsored by Crafter’s Companion. Ben joined Baltic in 2015 as an IT support apprentice, and having successfully completed level 3 qualification, has now been accepted onto his level 4 apprenticeship. Finally, charity DISC won the Heart of the Community award, which was sponsored by Star Radio. DISC is one of the North-East’s most successful home grown organisations, having spent more than 30 years committed to reducing deprivation and exclusion, and improving people’s wellbeing. Kerina Clark added: “We’re absolutely delighted with this year’s event – it was another spectacular evening of celebration, which not just singled out the individual winners, but also the dozens of companies which were shortlisted.